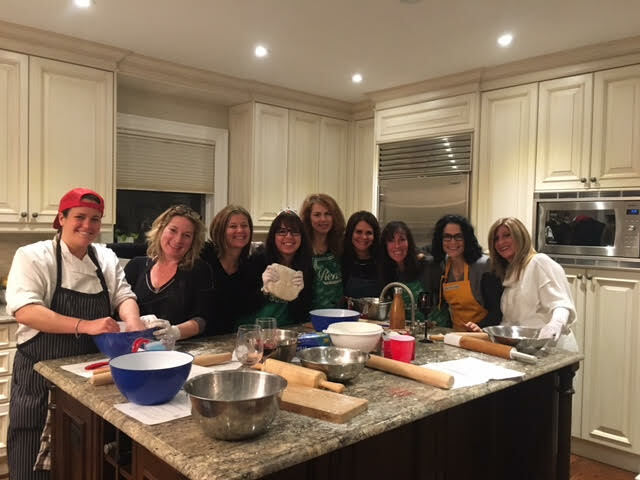 If you’re interested in hosting a fun, interactive gathering with friends, then a personalized in-home cooking class with Rooks to Cooks is a great option for you! • Minimum number of participants is 6 and the maximum is 10, depending on the size of the kitchen used. • All classes include the cost of ingredients. • Cost from per person, depending on the desired class. • At no additional cost, we will provide a wine list that will pair perfectly for the class of your choice (Available upon request). • All recipes used during our classes will be sent home with all participants to be kept for years to come. NOTE: If you and your group have a specific menu item in mind that we do not offer, our customized class is the perfect fit for you. Once your group has agreed on a menu, our team would be more than happy to develop a class just for you! Description: Throw a Pie Party with us and say goodbye to tough, crumbly, and sticky crusts. Through our step-by-step instruction, multiple demonstrations and hands-on support, participants will learn to make the perfect seasonal pie. During this class, our chefs will delve into the science behind gluten development and thickening agents to help our students understand how to achieve the perfect crust and filling. In addition to their newfound knowledge, participants will leave the class with their own raw pie, recipe card and baking instructions for future baking adventures. Our Delectable Doughnuts class is a fun and delicious way to learn the basics of bread development while letting your creativity flow. Learn to roll, shape, fry and decorate your own ½ dozen brioche doughnuts through multiple demonstrations and hands-on instruction from one of our fabulous chefs. Description: Are you ready to learn Chef Shai’s secrets to the perfect butter tart? Participants will gain secret tips and tricks to obtaining the perfect butter tart, not to mention they will get to take home 6 delectable tarts to share (or not) with friends and family. Whether you like them runny or not, this class is sure to teach you a valuable lesson in flaky and tender crust development, and how to reach the perfect filling consistency. Description: If you like fun, and you like food on a stick, then we have the perfect class for you. In lollipops and Hard Candies you will learn just that. This class is a fun hands on class for all. During this class, participants will learn the basics of sugar work and in teams make hard candy lollipops of their desired flavour. Participants will leave with an abundance of delicious treats on a stick and the knowledge of how to recreate the magic at home. Description: Get your cooking skills rolling with our signature sushi class. Through step by step instruction and guided practice, participants will learn the common knife skills used in sushi preparation, the art of rice cookery and how to roll and shape their own maki. Each participant will leave with 2-3 maki rolls to share with their friends and family, making this class perfect for a child’s birthday party or a fun activity for a gathering of friends. Don’t see the menu item you are interested in learning how to make? Contact the Rooks to Cooks team to help create an absolutely delicious customized party or get-together for you and your family and friends.